Not us... my parents! Back in December my dad retired after about 35 years in the ministry. More than 30 of those years were spent at First Baptist Church in Pillager, MN. 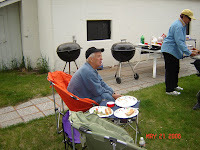 His first church was in Quamba, MN. Yep, I'm a small town girl... Saint Cloud is HUGE!! LOL I lived the first two years of my life in a parsonage in Quamba, right across the street from the church. The next decade of my life was spent in a parsonage in Pillager several blocks from the church. Next, we moved into a newly constructed parsonage built next to the church. 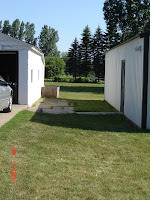 The garden is larger, the sidewalk/patio whatever it was is gone as is the cement pad next to the garage. We love the results! I couldn't find a good pic of the before for the patio replacement, but I found one that will give you an idea. (And, of course, if you've ever been to my house you know what it looked like...) We never did like that random little area before and we finally did something about it! We used a manual sodder and made the garden larger and used that sod to fill in the areas left when we took out the big granite pavers and the cement pad. I have a wonderful, hard-workin' hubby!! I'm leaving with the six kids tomorrow after my dentist appointment. While the week has already be changed some, we'll be spending lots of time with grandparents and cousins! Tim will join us for the long weekend, and I'm sure by then I'll be REALLY happy to see him! LOL The weather is looking to be a bit schizophrenic for the week... here's the 5 day in short (high's only): 78,66,88,68,70. Oh, wait, that was St. Cloud. Here's Pillager: 73,62,83,63,68. Ah, Minnesota. :) I've almost got everything together to pack, but I'd better go round up those last minute things. Then, off to bed! Hopefully J will sleep like she did last night -- I managed FIVE FULL HOURS OF SLEEP IN A ROW! Yay!! *just a reminder that you can click on a photo to view a larger version (opens in a new window). enjoy! Around here, this is what we refer to as "milk drunk". This little lady was totally unaware that I was taking her picture, so engrossed was she in her book. Anyway, I was cleaning my entry today and I thought I'd share this great tip I discovered almost two years ago while trying to bring back some of the "new" to my old house. It's a *bit* hard to see in the pictures, but if you look closely (hint: click on the picture to see a larger image in a new window) you can see a definite line where the floor goes from very clean to not so clean. Now, I washed 2/3 of the floor. The first half (closest to the top of the picture) I washed with Lysol, used a magic eraser, and then wiped with the Lysol again. The next 4 squares down were only scrubbed using the Lysol. The rest of the floor has yet to be washed. As you can see, the top portion looks much cleaner! So, invest in those little magic erasers. I admit, they don't work quite as well as I'd like for some other applications (such as removing crayon from the wall - not that we know anything about that around here...), but they definitely bring new life to my floors! We finished one project over the weekend, despite the fact that I got sick. The toddler bed got two coats of primer and two coats of paint, and still didn't cost anything! The paint was left over from the girls room (the bed is the color of the trim, and the screw *caps* are the darker color of the walls), and the roller, primer, and brushes were all things we had on hand. I also made the sheet and matching pillow case from some favorite fabric I had on hand. When I brought the mattress up and put it on the bed, the first thing Shi did was tuck in one of her "babies". Guess that's the stamp of approval. :) My mom and dad came for a visit on Saturday and brought my old daybed for Victory. The only problem is, the hardware was left behind! So, until their next visit (this coming weekend for S and J's dedication, Mothers' Day, and A's birthday) the bed remains propped against the wall. Most likely we'll get the boys old bed taken down and get the girls old bunks moved into the boys room sometime this week. Victory will just have to sleep on a mattress on the floor until we get that hardware. :) I don't think she'll mind too much.